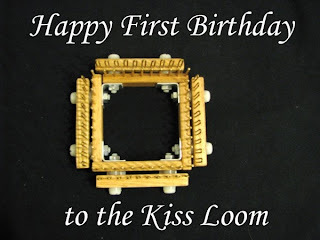 We attended the Kiss Loom’s First Birthday! It was like a very energetic chat room filled with door prizes and drawings, presentations, a game, and a party favor! Anne Bipes had the first presentation in which she discussed gauge. Now, here I am…a dummy…telling myself that I needed to make guage swatches so that I could change the number of rows and stitches I needed for this or that pattern (example: me and the Simple Pink Sweater in which I omitted 20 rows from the body and added rows to the sleeves so that it would fit me more like I wanted. :D). But Anne pointed out that with our Kiss Looms, we could do a guage swatch then simply adjust the setting and washers to achieve a more desirable guage. DUH!!!! I mean, I should have thought of that already. I had thought about it for hats, like doing an adult’s on one setting with so many washers, then reducing the setting and/or washers to fit a child’s head. Granted, I still would have shortened the Simple Pink Sweater’s body and lengthened the sleeves. But, why hadn’t I thought about changing the setting and washers? LOL! Then I was next to present with a lesson on lace. I had made a pattern for a fashion scarf that I named ‘Robin and Lace’ (like ribbons and lace, get it? LOL!) I used the Moonlight Mohair that Pam sent me for Teacher’s Appreciation Day to make this really long scarf. I explained how to do the ssk and k2tog that is used in the pattern in this new tutorial (NOTE: This is a different method than the previous tutorial I had made. 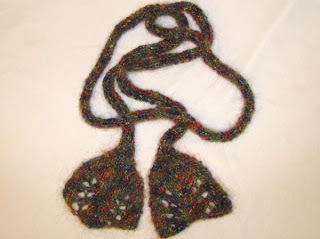 This is more based on needle knitting methods of ssk and k2tog). The pattern creates a sort of ‘v’ shape in the center of the lace where the ssk’s and k2tog’s slant toward eachother and I really liked it. It also shows the different ends and how it looks when you start a pattern with a lace design and then finish it with the same design. It turns out looking different. I got a sort of ‘fish tail’ at the end of the scarf, but more of a rounded edge at the beginning. 😀 Now, to create a hat to go with it. Bwahaha! The next presentation was by my tia, Maria! She had this awesome 3 in 1 pattern. 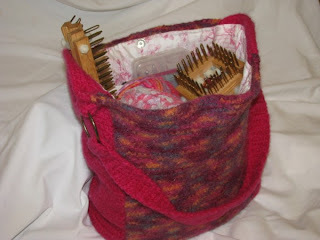 It is a cowl, but with a few alterations it can become a handbag or laptop cover! It is really gorgeous if you ask me and I can’t wait to make my first cowl using this pattern. Of course, it would look just AWESOME in different shades of PINK! And she mentioned that you don’t have to wear the cowl on your head, it can be worn as a neckwarmer or shawl type thing. Neckwarmer…that is what I need in the winter months. I find myslef hunching my neck down into my sweaters to stay warm. How silly when I could have made one of these all along?! LOL! Then Graciela worked on presenting Karol‘s Yarn Substitution Chart! I swear, if I had known exactly how to read that chart I would have used it many times by now. I am so happy that I now understand it and will be printing it out to keep in my binder from here on out! You can use it to figure out which yarns are likely substitutes for eachother. Let’s say a pattern calls for a certain yarn, but you don’t have it and your local yarn store doesn’t carry it and your only option is to order it online and pay a ton in shipping….or order a LOT of yarn that you really don’t need to add to your stash to get free shipping (LOL!). Karol’s chart can help you find out if you already have some yarn, or your local yarn store has some, that can be used in it’s place. It doesn’t account for texture (or fuzziness) but it can help with weight substitution. 😀 Really pretty invaluable, if you ask me! And my friend, Trudy, made her presentation on problems she ran into when starting out with the Kiss Looms and the differences between the Kiss and the KKs. Turns out, a lot of people had the same or similar problems that Trudy did in the beginning. And hopefully the presentation helped the very newcomers either fix mistakes they are making or prevent them all together. Last but not least was a game of ‘Pin the Peg on the Loom’ in which players picked a number from 1 to 15 to match up to a picture that Graciela had taken in which she had marked off one peg on the loom. The person who picked that peg number won. I had so much fun and was so wired that even though the party ended at 8pm, I was still awake at midnight! LOL! I can’t wait for next year, now! OH! 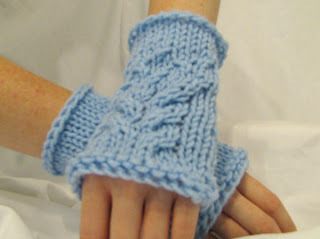 And here are the McCoy Mitts that I made up as a back up plan in case we needed it at the party. I am proud of them and think they turned out sooooo nice! And Angel has already made one and posted her picture to the Kiss Loom Group!